With the days getting shorter and grayer, we look forward to late fall activities. 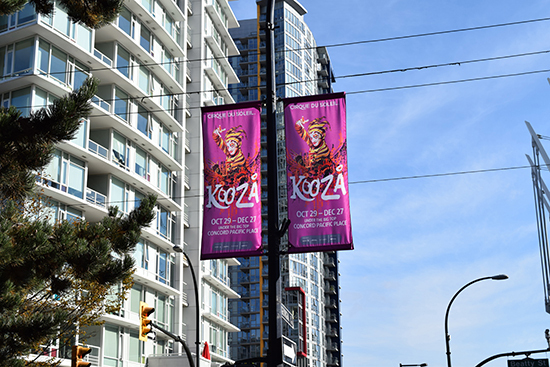 The bright purple of Cirque du Soleil’s Kooza banners makes a welcome contrast to the November gloom. 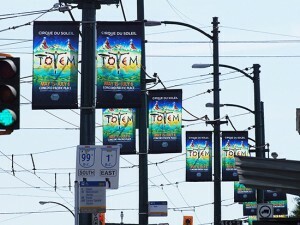 This is not our first time making their beautiful banners; we also produced banners for their Totem show last summer. 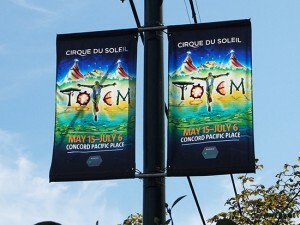 Now those banners have been given new life by Common Thread Co-op. They are currently available for purchase in our Vancouver store. 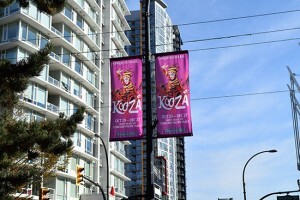 Kooza is playing until December 27th! For more information on Common Thread Co-op, please visit their website: www.commonthreadcoop.ca. 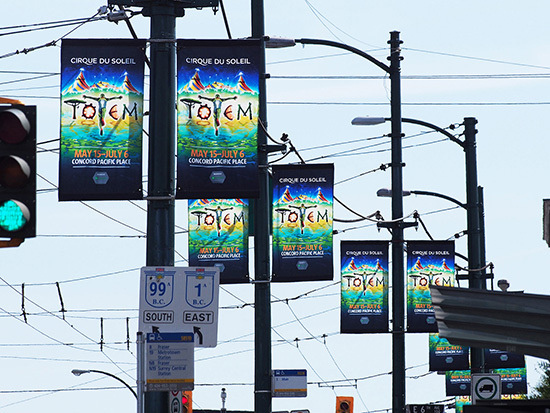 To find our more about the Cirque de Soleil show Kooza (and maybe even purchase tickets) visit their website here: www.cirquedusoleil.com/en/shows/kooza. Co-op TV recently put together this Common Thread Co-operative video which does a beautiful job explaining what they do and the difference they make in the lives of the women with whom they work. Susan has a cameo, and you can see some footage of our production area. Speaking of Common Thread! 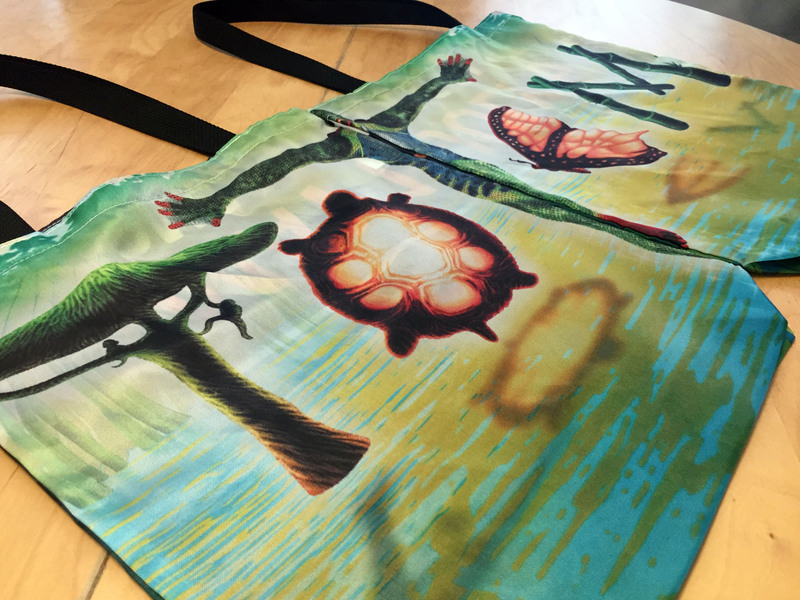 Spread the word – we are looking for banner donations on their behalf since they have been so wildly successful that they are beginning to deplete their stash of banners that they recycle into tote bags. We have already begun reaching out to our customers, but if you or someone you know is in a position to donate, please get in touch with Susan at The Flag Shop at (604) 736 8161 or (800) 663 8681. We will be happy to arrange picking them up. You can read more about their Banners to Bags program here. 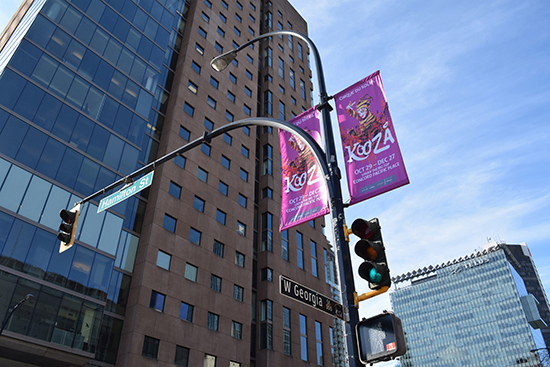 If you have been to The Flag Shop Vancouver office on Powell and seen the majestic sweep of our production facility (seriously, it’s glorious; we love it), you know we have quite a bit of room. Rather than putting in a foosball table or a hot tub, we have given some of that space over to the Common Thread Cooperative so that they have a place to set up their sewing equipment which they use for their Banners-to-Bags program among other sewing projects they take on. The Flag Shop founded the “Banner to Bags” program in the early 1990s, and worked with Coast Mental Health to develop their program Sewing with Heart, where individuals are trained in sewing as a means to re-enter the workforce. In 2009, Susan and Melanie Conn along with Coast Mental Health, Devco, the Women’s Economic Council and EMBERS founded Common Thread which provides job skills to individuals who thrive in a more flexible workplace environment by training them to sew used street banners into reusable bags. 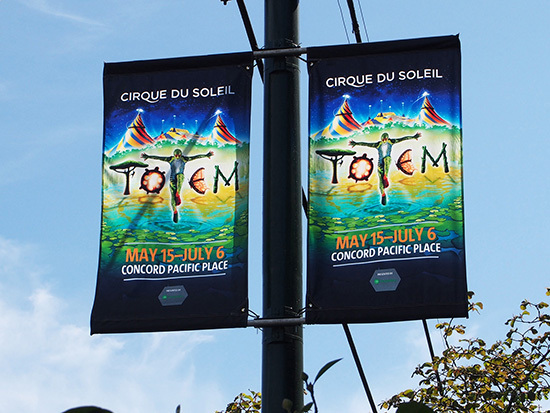 We allocate a portion of our production facilities to Common Thread at no charge, and we encourage our customers to have Common Thread “repurpose” their street banners into bags, once their banners are no longer needed. The United Nations has declared 2012 to be the International Year of Cooperatives. Both The Flag Shop and Common Thread will be participating. Common Thread is offering a 10% discount on tote bag orders if you order 2,000 bags before August 15th. Contact Melanie Conn at 604-736-0935 or find out more on Common Thread’s site at www.commonthreadcoop.ca. Susan has recently joined the Co-op’s board of directors where she acts as Secretary-Treasurer. The other two directors are Melanie Conn (President) from Devco Cooperative Training and Development and Jenette MacArthur (Vice-President) from The Kettle Friendship Society. The board provides overall direction to Common Thread as well as many kinds of support in the operation of the business. The Flag Shop is working on its own exciting project for IYC 2012 so stay tuned to find out more about our participation!